Home » Yohji Yamamoto » Oh! Sweet Paris. A STEADY bout of rain set the scene in Paris yesterday, as the fashion pack descended on the city to see what its designers have in store for the boys for autumn/winter 2008-9. First up, Louis Vuitton, where a dapper Joshua Jackson, in a silk scarf and trilby hat, sat a few seats along the front row from a surprisingly petit Pharell Williams. The music mogul may not have removed his giant dark shades for the duration of the Sixties gangster-inspired show (bopping his head to the soundtrack all the while), but he had an ulterior motive for his attendance - he is due to unveil a jewellery line for the house during the Couture shows. "It's a costly habit of mine," Williams told WWD of his penchant for 'bling'. "It's fun to do it on Louis Vuitton's dime for once." 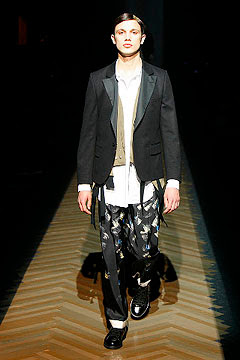 Stripes and tartan took centre stage at Dries Van Noten for an emotive show, set in a church, to a live classical trio, while there was more merriment to be found at Yohji Yamamoto; giggles broke the usually serious atmosphere at when the photographers started whistling for models who had to unravel their scarves at the end of the catwalk. Today all eyes fall to John Galliano, whose show is intriguingly – and rather aptly – entitled Ice - then there are cocktails coutesy of Corto Moltedo look forward to, as he shows off his ever-in-demand range of luxe man bags. Stella work once more, I'm sure you will agree.